Stay powered with innovation using the Whistler PRO-1600W Pro Power Inverter. The Whistler PRO-1600W Pro Power Inverter features Overload Protection which will automatically shut down if load exceeds inverter rating. Its Smart Surge Control feature will attempt to start loads above the continuous rating for up to 10 seconds. 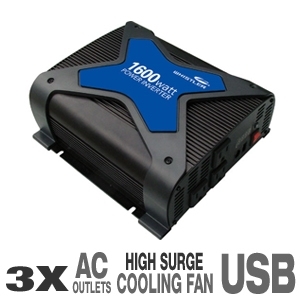 The Whistler PRO-1600W Pro Power Inverter's Voltage Protection kicks in Whenever the input exceeds 15 volts DC or is less than 10 volts, the inverter will automatically shutdown. It also delivers Short Circuit Protection, it Automatically shuts down until short circuit is removed. The Whistler PRO-1600W Pro Power Inverter also has a Thermal Cutoff, the inverter Automatically shuts down if internal temperature exceeds safe design parameters.